brian minchin is a genuis, the who story line was phenominal. i really got into the story. welll written. this story is about a mammoth in the new york history musuem. the fbi are ready to shoot it down but the doctor has other plans. come on a white mamoth? might aswell be something else? I have loved the first to books in the 11th Doctor series, so i had huge expectations for this one (maybe that was the problem). Unfortuanatly I really didn't like this one. The plot was very silly, and the constant amount of sarcasm between the Dr and Amy was great the first few times but after a while just started to get on my nerves. The police and NYPD Commander Jackie Stebbins I didn't care about and if they were all wiped out it wouldn't have worred me. What i did like thoe was there were a lot of referances to the tv series, particaly the Dalek 2 parter set in New York when Tennent was the Dr. And I particualy loved the referance to Torchwood - Children of Earth. This book was ok, there was enought in it to keep me reading and I did want to know what happened next. I will put this in the same pile as Sting of the Zygons, and Love and War (new adventure novel) - ok i've read it, now it will be on my bookshelf gathering dust. Not as bad as some people are making it out to be. 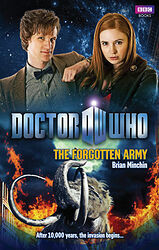 I thought The Forgotten Army was a good read, but not as good as the first two 11th Doctor novels. The mastodon - ship was the coolest part in my opinion; and when the doctor tries to cram himself into it had me cracking up. Worth the read for a fun afternoon.